Tally up what you spend on admission fees, lunch, and mental anguish, and you may find that bringing your kids to a major New York City museum comes at a high cost. That's why I admire families who diligently cram several such museum visits into one weekend trip. And since I had never taken my kids to the Guggenheim until this weekend, I was prepared to accept the worst. Well, not only did the Guggenheim surprise me, but my kids did, too. Here are ten things I learned while we spiraled our way down and around this most famous of New York City spaces. 1. Kids under 12 are free all the time, which offsets the $22 per adult admission. Plus, when you spread that cost over the four hours we spent there, it's a relative bargain. 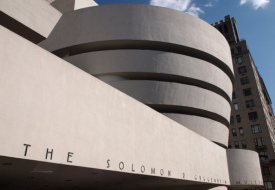 On Saturdays from 5:45 pm onward, the Guggenheim has a pay-what-you-wish policy, but, as the museum closes on Saturdays at 7:45 pm, know that you'll only have two hours. 2. Don't miss the family resources in the lobby. While waiting on the ticket buyer’s line (only a few minutes wait on this crowded weekend afternoon) Guggenheim staff greeted my kids and handed each an activity page encouraging them to identify shapes around the museum. Once we got our tickets, the staff advised us to come see them at the Activity Pack kiosk in the center of the lobby, which we did. Throughout the day, you can borrow tote bags that are stocked with worksheets, colored pencils, and small, kid-sized sketch pads. The pads helpfully have perforated pages, permitting you to rip out your drawings when you leave. There are only a limited number of totes to use and there's no time limit to how long you can keep one, so arrive early if you want to snag a bag; the latest you can borrow one is 4pm. 3. Work your way down. This one may seem fairly obvious, but rather than trying to scale the Guggenheim spiral from the bottom, ride the elevator to the sixth floor and slowly work your way down. If and when your kids get their second wind, you can work your way back up, but it'll feel like you're moving against tourist traffic the entire time. 4. Let your kids set the pace. My nine-year old daughter and six-year-old son were in tow during this outing and, if you had asked me beforehand what pace we were going to set, I would have told you they would have had us in and out of there in 45 minutes. Instead, with sketch pads and colored pencils in hand, they paused before artwork several times and took their sweet time sketching. I'm almost ashamed to say that I don't remember the last time I saw the two of them so engaged in something that wasn't broadcast by the Disney Channel. It was a revelation and a joy – not just to me, but to the many visitors who stopped to watch them draw or surreptitiously took cell phone photos of them sketching (for what purpose, I couldn't tell you). 5. The No-Photography rule is enforced. Since my kids and I made a beeline from the lobby to the sixth floor, I honestly didn't notice at first the signs indicating that photography is not allowed on the exhibit floors above the lobby and was instructed by a guard to stow my camera after I took the shot of my kids (above). As noted, this rule doesn't stop visitors from sneaking cell phone photos once the guards backs are turned. 6. Enjoy the friendly guards. While not every guard we came across was uniformly collegial – the guard who told me to put away my camera informed me that "people come to see the museum, not take photos," and I told him he didn't have to lecture me, which ended the conversation. Still, the guards and staff were otherwise genuinely patient. When my kids literally crossed the line (in front of some of the paintings there are black strips of tape on the floor that you're supposed to stay behind), the guard politely told me to pull the kids back. And I noticed them just as nicely telling other visitors the same thing, time and again. I don't for a second think museum guarding is an easy job. 7. No running is allowed, or encouraged. Despite the famous New Yorker cartoon depicting a child skateboarding out the front door of the Guggenheim as a bemused guard looks on, rapidly descending the Guggenheim spiral is not encouraged and running is not allowed – I asked a guard just to be sure, and, to her credit, she didn't look at me like I was totally crazy. If you go on a busy weekend as we did, it's also really not possible to move too rapidly down the spiral without slamming into gaggles of visitors with audio tour headsets. 8. The wall spiraling the museum interior is low. If you've ever anxiously shooed your kids away from the interior railing of a high-rise courtyard hotel or mall, then it helps to be reminded that the smooth concrete wall that swirls around the interior of the museum is somewhat low. I didn't measure the wall's height, but my 4-foot-tall son was able to comfortably crane his head and shoulders over the side (every chance he got, of course), so if you're as nervous about this as I was, hold your child's hand whenever you're on the move. 9. Be prepared for the single unisex bathrooms. There are a few one-person (and relatively clean) unisex restrooms on each level, but, when the museum is crowded, you likely will find people queued up in front of all of them. Encourage your kids to use the bathroom early and often whenever the opportunity presents itself. The museum's seventh floor annex and lower level Sackler Center both have wheelchair accessible restrooms. 10. The restaurant has the Wright stuff. A third-floor cafe has some wraps, pastries, coffee, and other drinks, but if that doesn't pack appeal for your kids, take a chance on the ground-floor Wright restaurant, which you can also enter separately from the museum; during our visit, we left the museum admission area, had lunch, and showed a guard our ticket stubs to regain entry to the museum. The restaurant has an appetizing kids meal for children 12 and under (a grilled ham-and-cheese sandwich with chips, fruit, and a brownie, a variation on which is available here year-round for $14). And, the restaurant staff was genuinely friendly to my kids, not sending any discouraging looks their way as they spun in their seats at the bar, which is where I recommend you sit to give your kids room to fidget. Once we returned home, the Disney Channel reclaimed my children. But their pile of Picasso and Cézanne sketches is a not-too-distant reminder that even one of New York's most intimidating museums can surprise you as well as help you to be a better parent, at least for a few hours.